Albert Einstein is rightly considered as one of the greatest minds of the last century. Other than being a total physics geek, he also had a wacky side which endeared him to many. On an off-day, he thought up of a tricky puzzle which although didn’t need a PhD to solve, still required some time and clever thinking to solve. We now call this Einstein’s Riddle and it can be used in the ESL classroom as the basis of a very good class. The vocabulary involved isn’t too difficult, so students can focus on improving spoken fluency, tune their listening skills, as well and learn a few new words and think critically. This is an excellent English lesson plan for teens and adults, which requires just a few photocopies and some cutting. Click on the link above to download the free Einstein’s Riddle worksheets, there are two pages. Photo copy the first page with the table and the houses. Make enough copies for all of your students, always print one or two extra just in case you have a new student or someone messes up and needs a new one. Print one copy for every student in your class. The free Einstein’s Riddle worksheet can be downloaded using the link above. Print one copy of the second page with the information about the houses. Using scissors or a guillotine, cut up the sentences into strips. There should be 19 sentences and you’ll need each sentence to solve the puzzle. Keep these together with a paper clip or in an envelope and bring to class. In class, give one information gap sheet to each student. Explain to the students that Einstein made a puzzle whereby people have to work out the colour of five different houses, the nationality of the families living in each house, what they like to drink, how they like to exercise and keep fit, and finally, the pets in each house. There are 25 boxes to fill in and it isn’t easy at all. Call a student to the front of the class and give them one of the sentence strips. The student should read out the sentence and the other students should listen carefully and write down the sentence in their notebooks. Ask the student to read the sentence a few times, so that everyone writes down the sentence correctly. Choose a new student to come to the front to read out the next sentence. Again, the other students should write down the sentence they hear. Keep going until all 19 sentences have been read out. This is excellent practice for clear pronunciation, but especially listening. 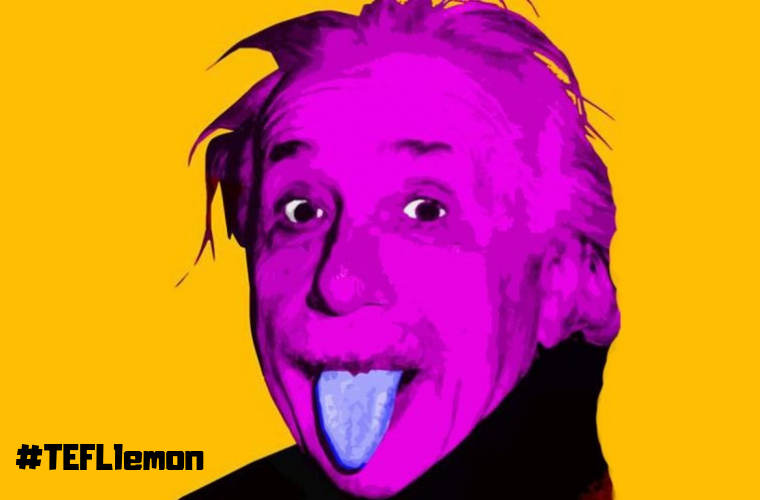 Don’t miss out any sentence, you’ll need all 19 sentences to solve Einstein’s Riddle! Once the students have written down all 19 sentences, they can now start using the information they have to fill in the table. It sounds easy, but Einstein’s Riddle will require thinking and working together to find the answer; perfect for English communication. Walk around the class lending help and support where needed. Encourage students to discuss things in English. It is a good idea to try to solve the riddle yourself before class. This will give you a good idea about the difficulty, but also how to solve Einstein’s Riddle so you can help the students if they find it impossible. Although the language isn’t too difficult, don’t throw this class at young children, they will never be able to solve it and will lose motivation. This should be aimed at teenagers and older. As a good and effective lead-in for this class, you can get a photo of Albert Einstein and put it in an envelope. The class have 20 questions to guess who is in the envelope. The teacher can only answer ‘Yes’ or ‘No’. At the end of the game, show the picture of Einstein and ask your teen and adult ESL students what they know about Einstein. Maybe you’ll learn something about him you didn’t know before! At this point, tell the class that he made a puzzle called Einstein’s Riddle and that you’ll be doing it today. The class will be ready and keen to try the puzzle. Have fun! 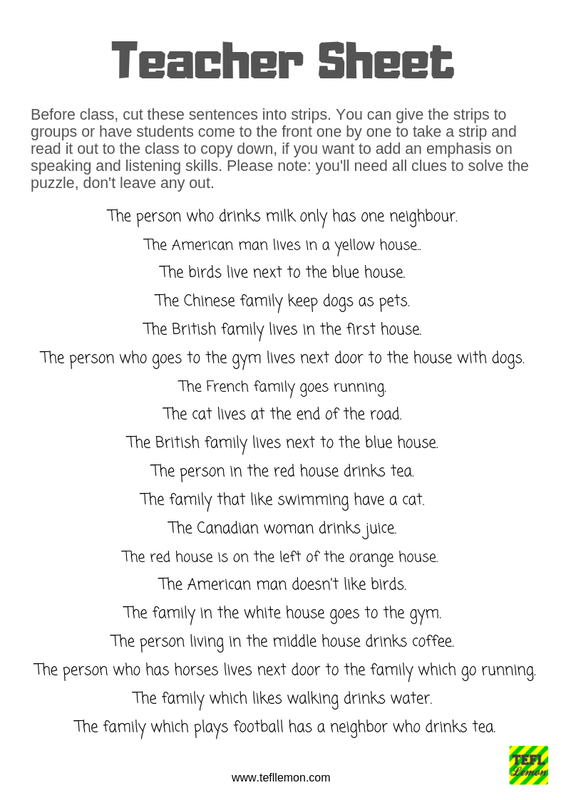 If you find that you have time spare at the end of the class, have your ESL students design their own Einstein’s Riddle! Instead of using house colour, drinks, exercise, etc, your students can have different information such as jobs, favourite holiday spots, food, whatever. Have your students first fill in the table and then write their own clues!